On March 7, 1998, while riding along the back side of Osan Airbase in Korea, at a speed of 42 kilometers an hour, I hit a rock and was thrown off my saddle, forward, into the handlebars. It knocked me about six inches into the air and my crotch impacted the top tube of the bicycle. Somehow, almost miraculously, as I was slumped over the handlebars, I managed to bring the bicycle to a stop without crashing...but I was very sore. The bicycle sustained no damage...amazing. If only someone had been video taping that recovery, I'd be a star! Then I wrote a poem for an old co-worker. J.C. Collins . The next week Stan Cook (the black dude), Matt Bronson (my boss) and I took the bus up to Seoul to do some sightseeing. It was cold that day. Stan had been with me at the 480th Intelligence Group (along with J.C. Collins) at Langley Air Force Base before we both ended up in Korea together. 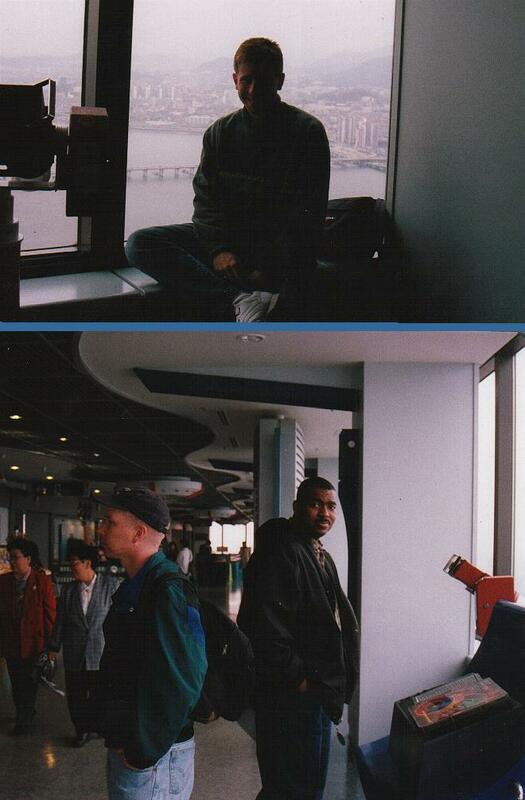 Stan and I often talked about Hondas in the hallway, but when we ended up in Korea together we became great friends. I was very goofy and used to tell him when I returned I wanted to live in his basement (he didn't have one) and his daughters would call me "Uncle Mike". He'd give me an uneasy smile. When my co-workers in Korea asked him about me he'd say,"I knew him at Langley but I didn't know he was nuts". 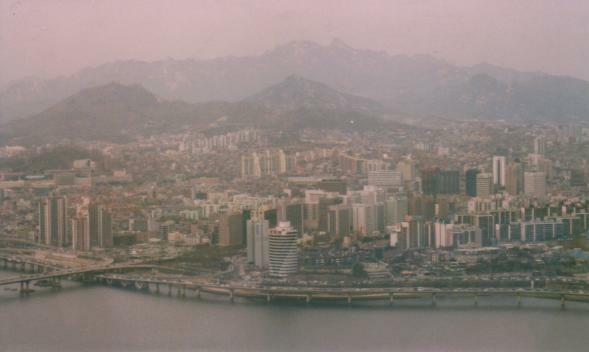 Our office in Korea was almost always laughing about something. We were a tight group and eventually Stan became a little looney himself. 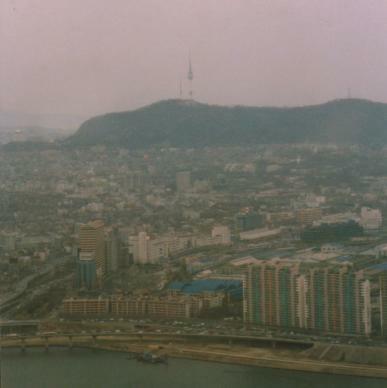 Photos are from DLI63, a 63-story tower on the riverfront in Seoul that I'd previously visited in 1988.